Pokémon Conquest is a creative and exciting new entry to the Pokémon family of video games, introducing a new way for fans to enjoy this legendary series on the Nintendo DS family of systems. 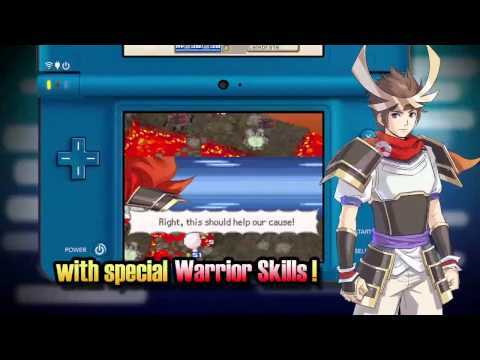 Set in the mythical land of Ransei, Pokémon Conquest sees you take the role of a young Warlord who is linked with a Pokémon, and together you must gather Warrior allies to strengthen the growing kingdom. Throughout your journey, you will encounter a variety of Pokémon, as well as Warriors and Warlords inspired by the Japanese feudal era. The game contains nearly 200 Pokémon, including many from the recent Pokémon Black Version and Pokémon White Version games. As the battlefield unfolds you must choose the correct Pokémon type to inflict maximum damage on your opponents. The turn-based skirmishes will keep you on your toes, making sure you choose the right tactics in intense six-on-six battles, where battle conditions can change on every turn. Story: Nobunaga is a powerful Warlord determined take over Ransei, and you'll need to stop him! You'll need to conquer different kingdoms to strengthen and grow your own kingdom – conquering and uniting all 17 kingdoms will awaken the Legendary Pokémon and save the land from destruction. Story mode is organised by episodes which you will unlock as you progress, and each episode features a different playable Warlord and victory conditions. Army Mechanics: Build your army by recruiting defeated Warlords and their Pokémon. But that's not all you get - once a kingdom is conquered, its faqcilities are yours to use freely, from training grounds, to shops to buy items, to mines for money. You can also strengthen your army by linking with Pokémon, switching between them before battle to ensure you have the right strategy for the type of battle they are about to engage in. Battle Mechanics: Each of the 17 kingdoms has a different type-themed battlefield that you will encounter and overcome, such as the fire-themed kingdom Ignis complete with lava flows, lava beds and fire spouts for players to battle around - strategically using water-type Pokémon to navigate through this battlefield will help you conquer this kingdom. You can also use the kingdom training grounds to train your army or find wild Pokémon and link with them. Using the built-in local wireless connection on the Nintendo DS, you can battle with friends who also own the game with their registered armies. Warlords and Pokémon: Just like Pokemon, there are different types of Warlord, and each Warlord has a special ability that can change the tide of battle. The type of Warlord will determine how well they link to particular Pokémon, and some Warlords even have the ability to link with several different kinds of Pokémon.